The Music City Walk of Fame is part of Nashville’s Music Mile. It is a city park that pays tribute to those with strong connections to the city of Nashville who have also significantly contributed to the music industry. This landmark which is open 24 hours a day is across the street from the Country Music Hall of Fame and is in close proximity to the city’s Visitor’s Center. 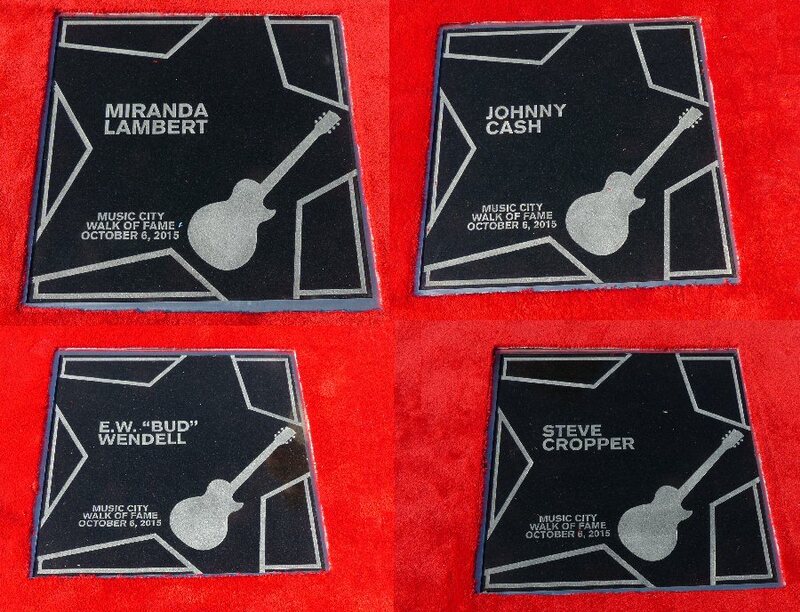 As one might expect plenty of country artists including Garth Brooks, Reba McEntire and Ernest Tubb are honored at the Music City Walk of Fame but you might be surprised to find that Jimi Hendrix, Kings of Leon and Peter Frampton have stars there, too. 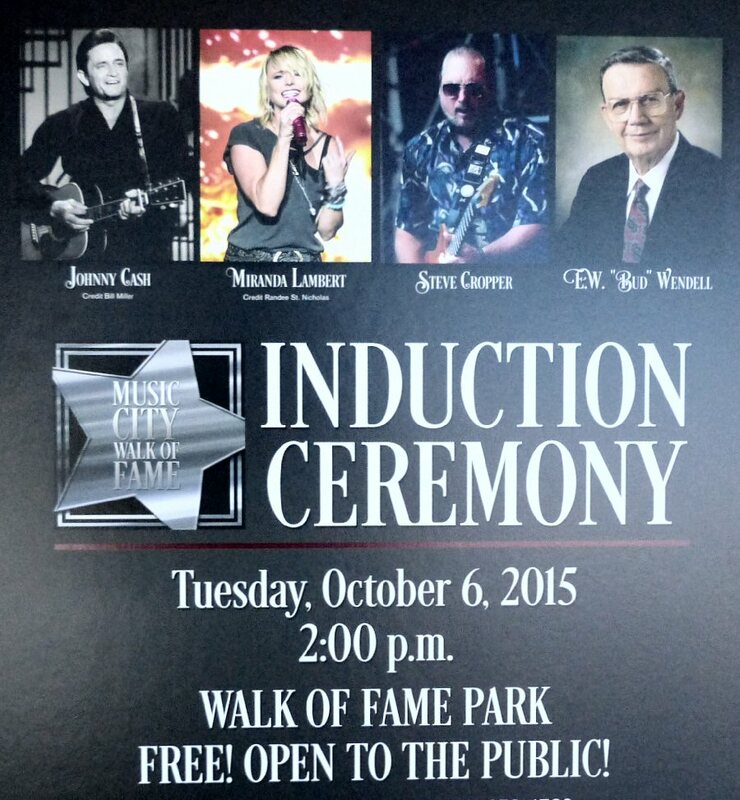 On October 6, 2015 four more famous folks were added to the Music City Walk of Fame at an afternoon ceremony. It was a warm, sunny day in Music City. 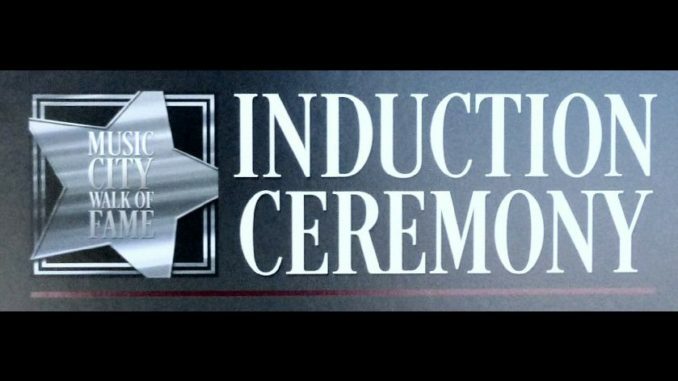 There was a stage set up in the center of the park with seating for guests of the inductees all surrounded by a free public viewing area. Major media was on the scene. Guitarist David Andersen entertained the crowd with medleys of music from many of the inductees including Roy Orbison. Bill Cody – the respected Grand Ole Opry host and WSM radio personality – was the emcee of the event. Nashville Mayor Megan Barry greets the crowd in Music City. 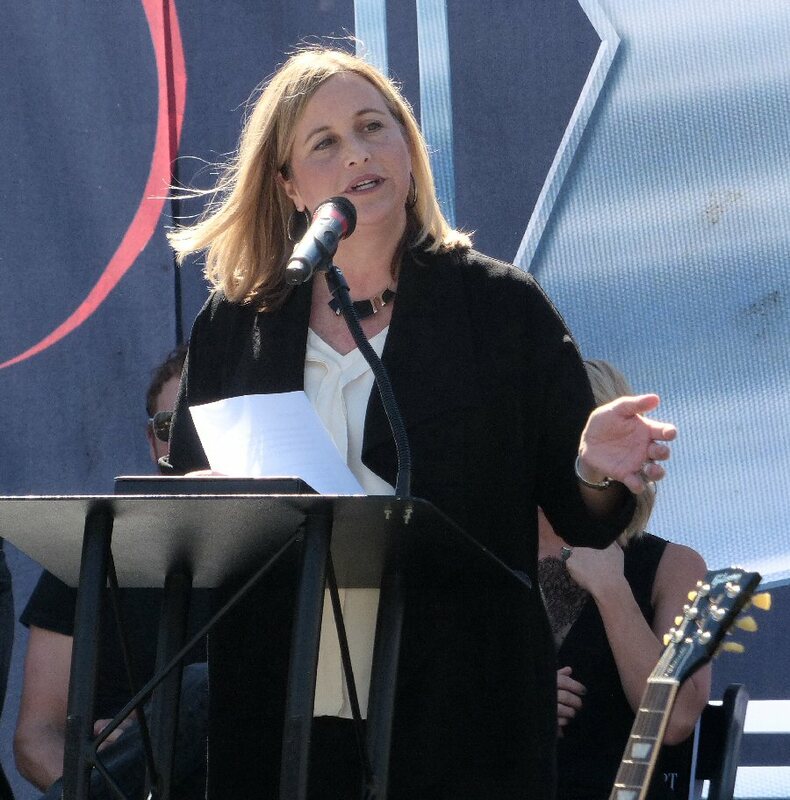 Nashville’s first female Mayor Megan Barry spoke briefly about each inductee. She shared that E.W. “Bud” Wendell understood and was instrumental in branding Nashville as “Music City”. Musician Johnny Cash is of course in a class by himself. Steve Cropper is one of rock n’ roll’s best guitar players who has called Nashville his home for many years. Chart topping Miranda Lambert has empowered herself and other women in the music business. Peter Cooper who presented the award to Mr. Wendell started his speech by asking the audience to look around to see what “Bud” has done, see the construction, hotels and growth that is taking place in Nashville. “Bud” was the man who smoothed over the differences between those who wore business suits and those dressed in rhinestones. Mr. Wendell received a standing ovation as he accepted his award. “Bud” commented on the attendees fanning themselves recalling the days when the Opry had no air conditioning, which is one of the reason it was moved to a new facility in 1974 with AC and in turn making it an even bigger attraction. This was just one of many accomplishments that are attributed to the modest Mr. Wendell. Miranda Lambert is one of Nashville’s hottest country stars. “Hello, I’m Tommy Cash,” joked Johnny’s brother who received the award on behalf of Cash who died in 2003. Tommy stated that his brother put a lot of work into everything he did. “I was 15 when his first record came out and I still miss him, his spirit is here,” stated Tommy. He also shared how his older brother taught him to swim by tossing him off of a bridge. It’s interesting that cross-over Cash was often considered a renegade in the country music world but now is much revered as one of the genre’s most influential artists. Steve Cropper is a well-respected guitarist, producer and songwriter known for penning major hits such as “Green Onions”, “In The Midnight Hour”, “Sittin’ On the Dock of the Bay” and many more. Cropper appears on numerous guitar great lists. Joe Chambers – director of the Musician’s Hall of Fame – shared Steve’s accomplishments and his own memories of Cropper. The award winning Cropper received a standing ovation. He acknowledged the crowd sitting in the hot sun for this event and then pointed out his beautiful family. Steve shared a quick story about roasting Johnny Cash before thanking everyone and stating that he is a proud Nashvillian. Dierks Bentley, E.W. “Bud” Wendell, Steve Cropper and Tommy Cash in Nashville. Musician Dierks Bentley said he had a lot of road stories he could share about Miranda Lambert. “She is a true touring artist – authentic willing to fight the system,” said Dierks, “congratulations to my friend”. Miranda was warmly greeted by her fans. Lambert shared that recently she felt that she was a bigger part of Nashville as she has been in Music City for a few months writing songs every day. She recalled making her first record here, getting scared but then going out on the road. As folks know Lambert went from playing dive bars to stadiums. 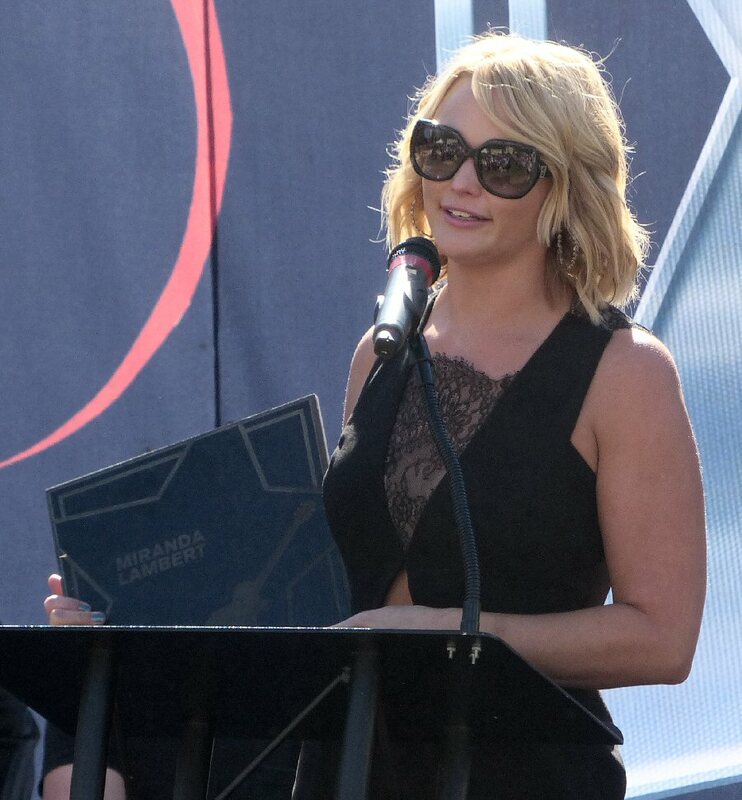 Miranda received the 70th star on the Music City Walk of Fame. That same night Lambert performed two packed to capacity concerts at the Opry. 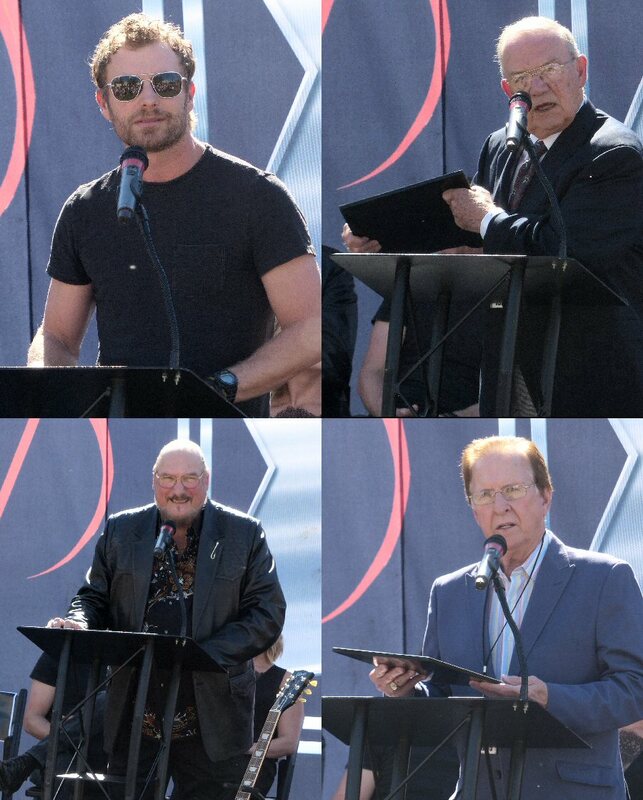 Four new stars shine on the Music City Walk of Fame.